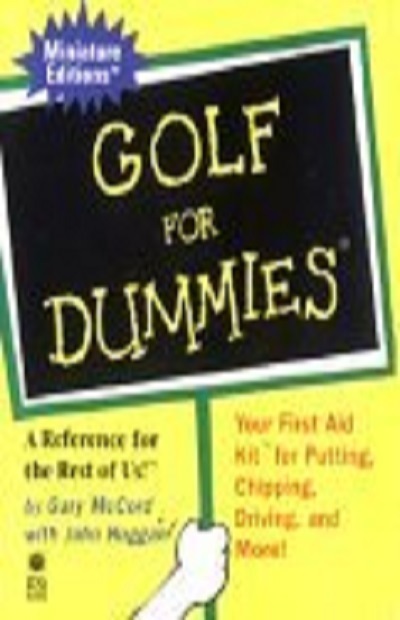 If you don't know the difference between a lob wedge and a lemon wedge, check out Golf for Dummies, by CBS commentator Gary McCord, one of the game's most colorful--and knowledgeable--characters. It's a wonderful, often hilarious, never boring introduction to the game. Don't let the foreword by Kevin Costner or the afterword by Hootie and the Blowfish confuse the issue; this is a terrifically sound, easy-to-follow primer. McCord's potato-chip drill--yes, potato-chip drill--will revolutionize your swing, and your thinking, with overtones that could spill directly into off-the-course existence, as well. Golf is a simple game. You have a bunch of clubs and a ball. You have to hit the ball with a club into a series of holes laid out in the middle of a large, grassy field. As simple as it is, many people believe golf is the hardest game in the world. If you’re like most golfers, you play the sport for fun, relaxation, and a chance to get out and enjoy the great outdoors. If you’re like Arnold Palmer, Jack Nicklaus, or Tiger Woods, you get to do all that – and make a gazillion dollars to boot! Author and CBS television golf analyst Gary McCord is a PGA Senior Tour champion and a golf instructor to many celebrities.